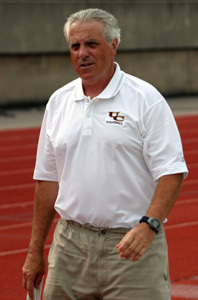 Tony DeMeo has 25 years of experience as a head college football coach and has an overall record of 137-108 -4. He has successfully turned around four college programs. DeMeo is considered an offensive innovator for combining a passing attack with the option. His Triple Gun Offense has broken records everywhere he has been. DeMeo is a proven teacher of the game; he has published numerous books and DVDs and is a popular speaker on the clinic circuit. 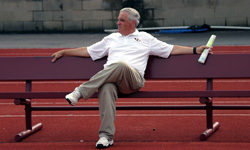 Tony DeMeo recently retired as the Head Coach of the University of Charleston after a extremely successful six year tenure. The Golden Eagles were 43-23 under DeMeo. He came to UC in 2005 and promptly turned the program around on and off the field. The 8-3 season marked the greatest turnaround in conference history and DeMeo was named D2.com WVIAC coach of the year. Off the field the Golden Eagles team grade point average went from a 1.6 to a 2.8. In 2009 DeMeo led the Golden Eagles to a 9-2 record and a 19th place ranking in the American Football Coaches Association poll. His 2009 team set numerous records and finished seventh in the nation in scoring, first in the nation in pass efficiency, fourth in the nation in rushing, seventh in the nation in red zone offense. Defensively the Golden Eagles led the conference in rush defense, scoring defense, and total defense. DeMeo’s six seasons at the helm of the UC football program have produced more victories than any other six year period in school history. The Golden Eagles broke virtually all the school’s offensive records during the DeMeo era. DeMeo also had a successful turnaround at Washburn University in Topeka Kansas. He took over a program that had only 3 wins in the previous 3 seasons and had instant impact. In 1999 he led WU to its first winning season in 10 years and was named MIAA coach of the year. At Mercyhurst College DeMeo started the football program from scratch fielding the school’s first football program in 1981. His seven years at the ‘Hurst produced a 41-21-2 record. DeMeo was named 1985 Coach of the Year by the Eastern Intercollegiate Athletic Association and “Man of the Year” by the Erie JCs. DeMeo began his head coaching career at his alma mater, Iona College and compiled a 22-10-2 record including two conference championships. DeMeo was twice named Metropolitan Conference Coach of the Year in 1976 and 1977, and was inducted into the Iona College Hall of Fame in 1997. 2017 Hall of Fame Inductee Mercyhurst College Erie, PA.